Cataract surgery is one of the most common and successful surgical procedures performed today. Over the past decade, the risk of severe complications has decreased with advances in surgical instruments and techniques. In the procedure, the cataract (cloudy lens) is removed, and a clear intraocular (in-the-eye) lens is placed. Rare complications include intraocular lens (IOL) dislocation, where the lens moves out of place. The most common symptom of a dislocated IOL is a change in vision. The degree to which vision is affected will depend on the severity of the dislocation. IOL dislocation can also lead to other complications such as retinal detachment, bleeding, intraocular inflammation, macular edema, glaucoma, and corneal edema. During most cataract surgery procedures, the IOL is placed inside the capsular bag, a sack-like structure in the eye that previously contained the cloudy lens. In some situations, this extremely thin capsular bag or the fibers that hold it in place rupture and the IOL support is compromised. 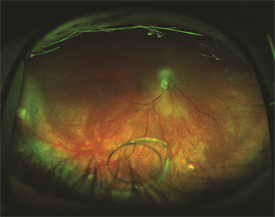 Dislocation of the IOL can occur days to years after surgery and can be a result of factors during the original surgery, trauma to the eye, or diseases that affect the stability of the capsular bag. Your retina specialist will perform a detailed eye exam, including a careful examination of the peripheral retina. The dislocated IOL is sometimes photographed to document the extent of the problem. When a clear view of the retina cannot be obtained directly, an ultrasound of the eye can be helpful. Based on the characteristics of the IOL dislocation, there are several different approaches to repairing this issue. In cases where the IOL dislocation is minimal and does not have a large impact on vision, your doctor may not recommend any treatment at all. When vision is affected and the patient is experiencing symptoms, surgery becomes necessary. In this surgical procedure, the vitreous gel that fills the eye’s rear cavity is removed (vitrectomy) to prevent pulling on the retina while the IOL is being manipulated. IOL rescue/reposition: The dislocated IOL is preserved and repositioned in a more stable location. The possibility of using the existing lens is based on many factors including the style and condition of the IOL. IOL exchange: The IOL is removed and a new IOL is inserted. Potential complications of the procedure include retinal detachment, uveitis (inflammation inside the eye), infection, glaucoma, bleeding, and re-dislocation of the IOL. With prompt and careful management, most patients with IOL dislocation have a good visual outcome following a corrective procedure.